Every cat needs a little nip sometimes, and this Nip-Stick® Natural Catnip Stick by FFD Pet makes catnip use easier than ever! Irresistible to cats! Watch them go wild! Bring out the real tiger in your kitty the Nipstick®! 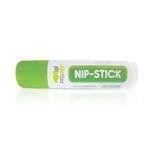 Potent North American catnip oil makes the Nipstick® difficult to resist! Great on your cat's favorite toys, cat scratchers, cat furniture or dab a little onto your kitty's paws and stand back to experience your cat's inner roar! Ingredients: Beeswax, Coconut Oil, Mango Seed Butter, Castor Seed Oil, Apricot Kernel Oil, Catnip Oil. The website is great. I like how you all work and what you sell. The only down side this purchase was that I didn't know how big the metal clip part on the leash would be. I have a small, 7 pound dog and the latch on the leash is for a big dog. I wish that there was a way to tell on the site how it is.